Dallas native Olin Travis was born in 1888. After graduating with honors from the Art Institute in Chicago in 1914, he relocated to Dallas in 1924 and established the Dallas Art Institute with his wife Katherine and a friend. This was the first art school in the south to offer varied disciplines. Olin Herman Travis was a Dallas-based artist, muralist, and teacher who worked in Arkansas periodically for about twenty years. For a three-year period in the late 1920s, he led the Travis Ozark Summer Art School near Cass (Franklin County). Olin Travis was born in Dallas, Texas, on November 15, 1888. He was the second of six children born to Olin Few Travis and Eulalia (Moncrief) Travis. His father was a printmaker. Travis graduated from Bryan High School in Dallas in 1906 and from Metropolitan Business College in Dallas in about 1908. Interested in art from childhood and encouraged by his high school art teacher, Travis studied briefly in Dallas under Max Hagendorn. In 1909, he enrolled in the School of the Art Institute of Chicago (AIC). He studied there for five years under various instructors, including Charles Browne, Ralph Clarkson, Kenyon Cox, and Joaquin Sorolla y Bastida. He graduated with honors in 1914. In 1913, Travis made his first trip to Arkansas, accompanied by a classmate from the AIC, and spent four months sketching in the Ozarks. After returning to Chicago, he worked as an instructor at AIC before taking a position at the Chicago Commercial Art School. Travis met Kathryne Bess Hail while she was a student at AIC in 1914. The couple married in Ozark (Franklin County) on November 15, 1916. They had two children. The Travises worked in the Chicago area before relocating to Dallas in 1924, where they established the Dallas Art Institute (DAI) with James Waddell. The first major art school in the South to offer instruction in a variety of fields, the DAI went out of business by 1945. Travis was an instructor there and served as its director until 1941. In the summer of 1927, the Travises established the Travis Ozark Summer Art School at an abandoned sawmill near Cass. Kathryne Hail Travis, who grew up in nearby Ozark, had painted in the Cass area while growing up, and the couple was able to rent the sawmill buildings very inexpensively. The school, which was an adjunct of the DAI, was held each summer for three years (although evidence indicates additional summer classes may have been held as late as 1935). The school had up to fifty students in attendance. There were about fifteen crudely furnished cabins and a lodge at the camp. Classes were held for a period of one to two months beginning in June and were open not only to DAI students but also to Arkansas residents and other students from surrounding states. On weekends, the students exhibited their paintings, held dances, and put on impromptu performances. Travis made sketching trips to Arkansas almost every summer from 1914 until 1935. On one such trip in 1925, he met Everett Spruce, a teenager who lived in Mulberry (Crawford County). In 1926, Spruce moved to Dallas to study under Travis at the DAI and eventually emerged as a major American artist. Although Travis worked primarily in Franklin County, he also spent time in Eureka Springs (Carroll County) and parts of western Arkansas. 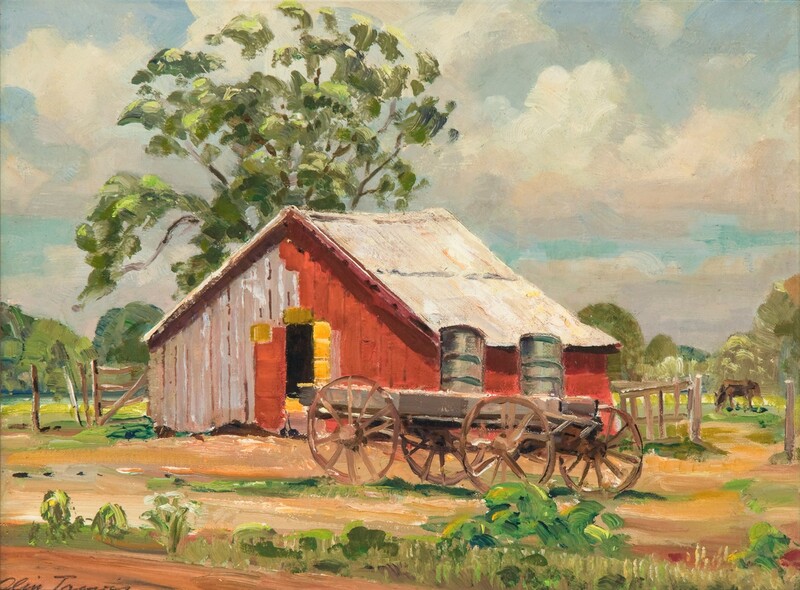 He enjoyed painting not only the beauty of the Ozarks but also capturing its denizens in their everyday activities, such as shelling peas, making sorghum, and picking cotton. Travis collected sunbonnets and did a series of paintings of Ozark women featuring the headwear. One such painting, Whither, won the award for figure composition in the Texas Allied Arts show of 1930. In 1934, the Travises divorced, an event much publicized in Dallas and Denver newspapers. 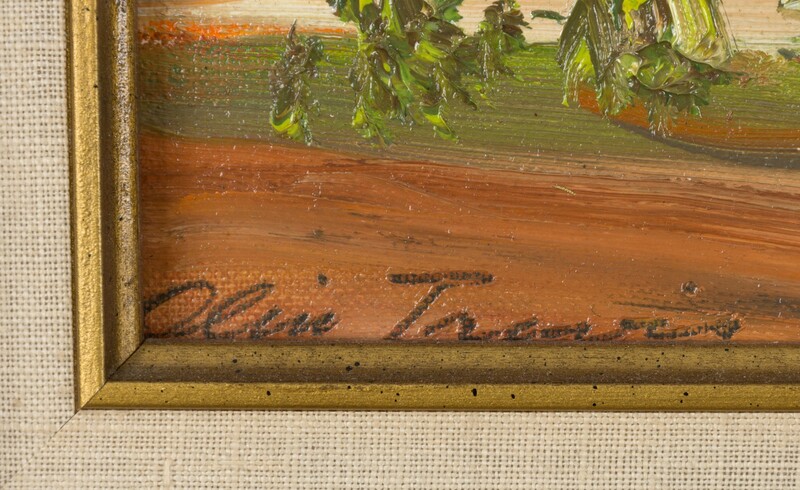 Olin Travis married Josephine Oliver the following year. An accomplished violinist and artist, she played with the Dallas Symphony. They had no children. 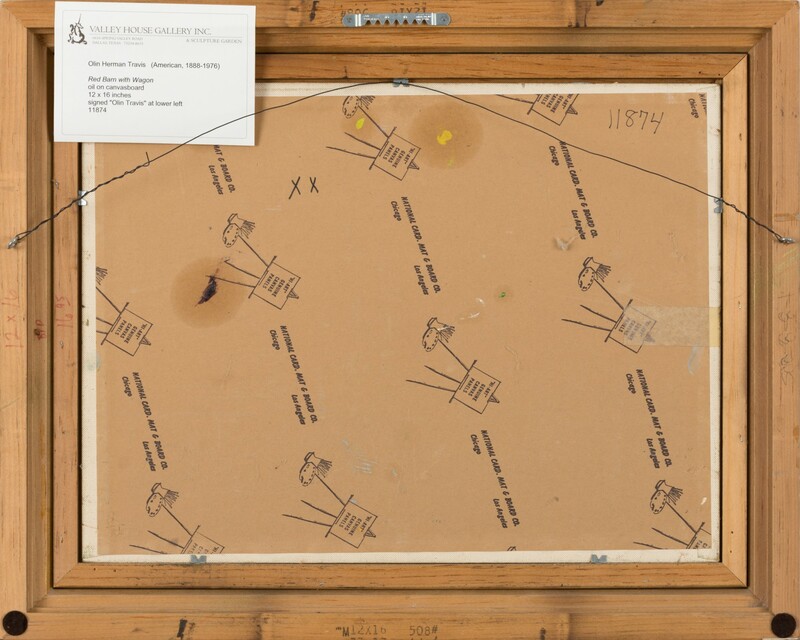 A fire in Travis’s summer home in Arkansas in 1935 destroyed many papers and early works. Travis also painted in Colorado, Florida, Michigan, and Missouri. He exhibited extensively in the Dallas–Fort Worth area for about forty years beginning in 1914 and also exhibited in New York, San Francisco, and Chicago. He won many awards during this time and had several one-man shows of his work, including a retrospective at the Dallas Museum of Fine Arts in 1953. Travis was one of ten Dallas artists who had their paintings included in the art exhibition of the Golden Gate Exposition in San Francisco in 1938. His painting, titled Country Schoolhouse, was based on an old school he had sketched in St. Paul (Madison County). 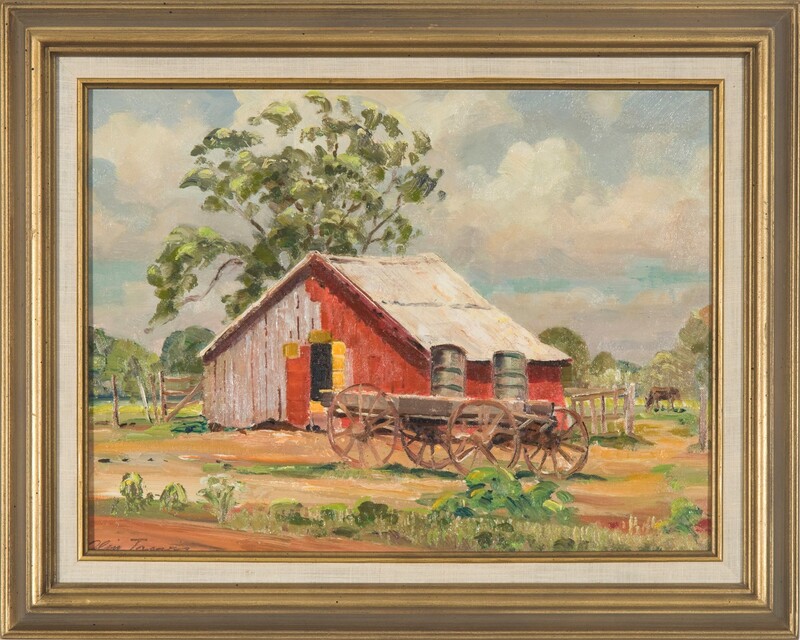 In 1940, Travis participated in the short-lived Arkansas Watercolor Society Annual Exhibition. Olin Travis also created a number of murals, including two completed in 1936 with themes based on the discovery of oil in east Texas. He excelled at portraiture and was highly regarded for his painting of a blue-collar individual titled The Workman (1930), which toured the country and received multiple awards, and also for a portrait of a bedraggled Depression-era man called Mayor of Hoover City (1929). Travis was a founding member of the Southern States Art League and helped to establish the Federation of Artists in Dallas in 1946. He remained active as an artist until his death on December 4, 1975. He was cremated in Dallas. Forrester-O’Brien, Esse. Art and Artists of Texas. Dallas: Tardy Publishing Co., 1935. Green, Rebecca H. “Travis, Olin Herman.” The Handbook of Texas Online. http://www.tsha.utexas.edu/handbook/online/articles/TT/ftr26.html (accessed June 5, 2007). Powers, John, and Deborah Powers. Texas Artists, Sculptors, and Graphic Artists. Austin, TX: Woodmont Books, 2000. Smith, Goldie Capers. The Creative Arts in Texas. Dallas: Cokesbury Press, 1926. Travis, Susan. “Pilgrims of the Palette: Exploring the Artistic Legacy of Olin Herman Travis,” PhD diss., Pacifica Graduate Institute, 2006. University of Texas at Arlington"